It’s clearly winter out there and yet here I am cranking out some yummy sorbet. I can’t help myself. I read this post on Smitten Kitchen and it just sounded too easy and too divine. I love making sorbet, usually yummy fruity ones, like Pineapple & Mango or Raspberry. There is usually very little preparation work and just a short list of ingredients. The ice cream maker does all the work. My ice cream maker was actually one of the first appliances I bought for my house. It’s a Cuisinart and it has been critical in opening up the world of frozen dessert to me. The only complaint, which most people seem to have, is that it is quite noisy. So noisy, that I’ve put the ice cream maker in the bathroom, the basement and the spare room with the door shut to keep the noise down while it churns up frozen goodness. The noise is a very small price to pay for the results. Homemade sorbets and ice creams taste completely different. As I was pouring the liquid sorbet into the ice cream maker, I just knew this was going to be an easy favourite. The chocolate upon chocolate flavour, with a hint of vanilla, is a delightful way to feed a craving. This recipe is going into my permanent collection. It’s beyond delicious. Another chocolatey favourite of mine are these Bloomin’ Brilliant Brownies by Jamie Oliver. wow, that looks seriously good. last year a friend gave us his ice cream maker, and yet, i have never used it once. i think i might be inspired! Thanks for that! I wish I’d had that for breakfast rather than my bagel and coffee. I don’t have an ice cream maker but a family favourite (if you have a food processor or blender of some sort) is 2 cups of frozen berries/fruit (I like raspberries)and 1/2 each of cream and icing sugar. Mix it all together and instant ice cream! Glorious. Thank you for posting this! I’ve been wanting to get an ice cream maker for a while now. I can’t eat dairy or soy and tasty frozen treats can be hard to come by so I figure I’ll make my own. 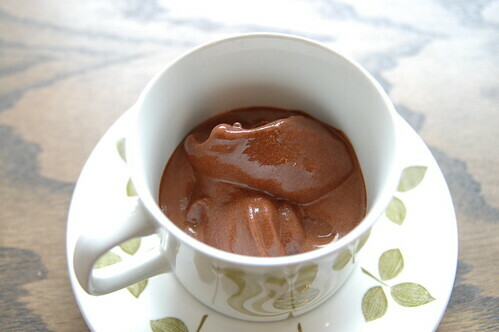 Knowing that a decent frozen chocolate dessert can be made without dairy is very comforting! WOW – this looks amazing. This would be the perfect finish to the lunch I just inhaled at my desk. I guess I will settle instead for a Halloween Treat that my colleagues brought in from their kid’s reject piles! What is the exact name/model of the ice cream maker – we have been thinking about getting one? Lisa – you need to get on that – you can make margaritas in your ice cream maker too! charlotte – ohhhhh, that sounds just lovely and i’m totally going to try it. heidi – most of the recipes i love to make don’t use any dairy and they are so much tastier than anything you can buy. lauren – this is a photo of the one i have. almost any department store or william sonoma carry it. Mmm… that looks so good! Lisa – I have a weakness for margaritas … and tequila! Anabela – oh yes, that was a great episode. i REALLY like lily and rufus together, so love when bart gets snubbed. can’t wait for the next!